A young boy stands at the grain mill, cranking the handle repeatedly, though there are no grains in it. He seems entranced by the simple, repetitive motion, and the low-tech task—closer to a 19th than 21st century activity—holds his attention for a solid 10 minutes, while his parents listen to the kindergarten teacher at Bend’s Waldorf School explain the school’s philosophy on early childhood education during a recent open house. “Children are more and more now sitting in front of a screen, losing that capacity for being and doing,” says teacher Terry Anne Paquette. In fact, the grain mill is not a toy for make-believe; the young students actually use it to grind barley and other grains. While other children might make virtual cakes on iPad screens, Waldorf students bake real bread to eat with their soup at lunchtime. It is part of the school’s focus on practical, hands-on education that encourages students to use their bodies. That approach extends well beyond kindergarten—students of all grades learn by doing and technological tools, like computers and iPads, are kept out of the classroom until the eighth grade. Inspired by the teaching philosophy of Austrian philosopher Rudolf Steiner, Waldorf Schools have a reputation for shunning technology—which is increasingly an anomaly in an educational climate increasingly focused on using tech tools, such as computer labs and iPad programs. But proponents insist they aren’t luddites. Rather, teachers and parents of Waldorf students say they support the age-appropriate use of technology; they just don’t think it belongs in the grade-school classroom. In fact, Waldorf schools are popular not just among the back-to-the-earth, neo-hippie set. In Silicon Valley, the local Waldorf School enrolls the children of a number of computer engineers and other high-tech types. Advocates note that many Waldorf graduates go on to careers in technology. Fifth- and sixth-grade teacher Laura Elmore proudly shared that one of her Waldorf-educated daughters was recently accepted to the California Polytechnic Institute. Advocates of the low-tech approach to learning argue that over-reliance on technology discourages creativity and imagination. At the Waldorf School, lessons are embedded into fairy tales and other stories, which teachers modify to suit the material. Rather than sitting in front of the class with a picture book, teachers act out the stories, telling them from memory and encouraging students to paint their own mental pictures. That’s part of the reason the Waldorf school asks families to avoid television and video games during the week. Willis says taking in too much media makes it harder for children to remember the stories they are learning in class. But the school doesn’t dictate what students do in their free time, and the school’s faculty and staff acknowledge that most students are exposed to technology at home and with their friends. Still, the school’s emphasis on human connection is a large part of what attracted Hansen’s family to the school two years ago. Hansen says that she and her husband were looking for a “more balanced” form of education, and that the school’s low-tech model has inspired her to minimize her own screen time. 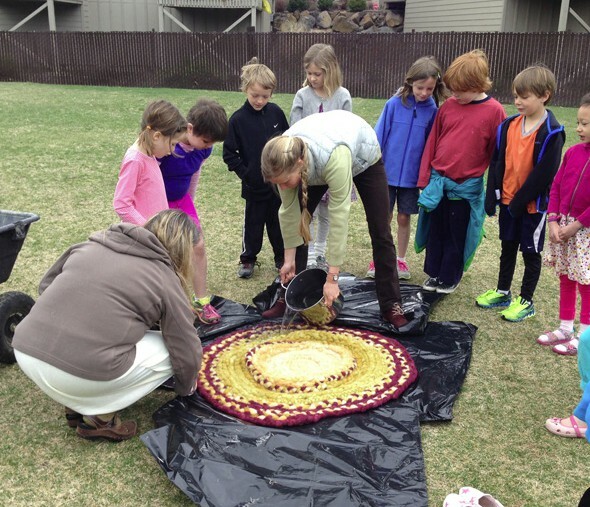 “Last week, I was on a field trip with the first grade in Shevlin Park. Rather than the texting and email frenzy that goes on throughout my day, I chose to ‘be’ with the kids and ‘be’ with Shevlin Park, and it made all the difference in my day,” Hansen says. By eschewing high-tech tools (and even limiting the use of calculators), the Waldorf school encourages students to create, rather than consume. While iPads are often praised as an alternative to carrying around backpacks weighed down by heavy textbooks, Waldorf students simply don’t use them. Instead, they transform the knowledge imparted by their versatile teachers (most of whom follow their students for multiple years and teach a variety of subjects) into hand-written and illustrated books containing everything they’ve learned over the school year. While many American children learn to read with the help of television programs, such as Sesame Street, Waldorf schools teach students literacy inside out—writing first, then reading. By the second grade, students are writing research reports using primary sources from the library, not Google or Wikipedia. Instead of using computer programs to learn typing or math, Waldorf students are taught to write out their assignments in cursive script and practice their times tables to the rhythm of the grapevine. As a result, learning looks different at a Waldorf school. There are no rows of students starring blankly at textbooks, PowerPoints, films, or computer screens, while robotically filling out worksheets. Teachers illustrate concepts through story, song, dance and elaborate chalk drawings. Students rarely have homework. Instead, they are likely to be found dancing, farming, weaving or otherwise incorporating their lesson plan into some type of physical activity. Elmore says she is preparing to take her class on a multi-day camping trip, during which they will learn orienteering using a compass by day and the stars at night. Teachers add that while their methods may seem to some old-fashioned, students are learning important survival skills. While tech-savvy may be a requirement in this digital age, most students will pick up computer skills quickly enough at home or in high school. Skills like woodworking, knitting, hand-sewing and farming are harder to come by—and not easily taught by an app. And while not every family will adopt a strict at-home technology policy, the school’s philosophy is inspiring parents to rethink their relationship with gadgets, and with their children.